The much awaited India Australia series is here! Every time these two teams clash on the cricket field, it is a delight for the cricket fans to watch. We expect you might also be familiar with the ferocious rivalry between these two teams. Remember India’s controversial tour of Australia in 2008. Well, how can that be not on our list? The second test match of famous Border-Gavaskar Series at Sydney cricket ground became an infamous affair because of umpire Steve Bucknor’s poor umpiring. hat test match saw some terrible umpiring decision taken by the on-field umpire Steve Bucknor, Mark Benson and the third umpire Bruce Oxenford in the favor of the Australian cricket team. It was a moment of utter disgrace for the Aussies but the thing is, they felt none. 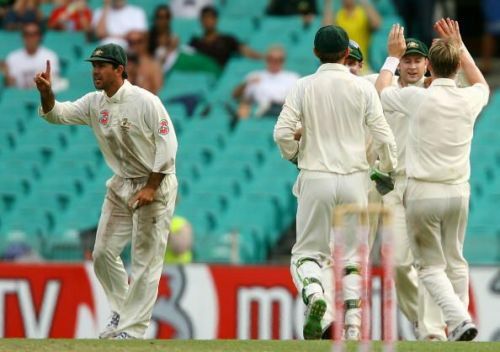 Things got even worse, when umpire Mark Bensen asked Australian captain Ricky Ponting whether the fielder carried the ball neatly or not and working on Ponting’s direction, the umpire sent off Indian batsman Sourav Ganguly. At the end of the day, Bensen, Bucknor, and Oxenford had collectively taken 9 wrong decisions, all in favour of the Aussies.